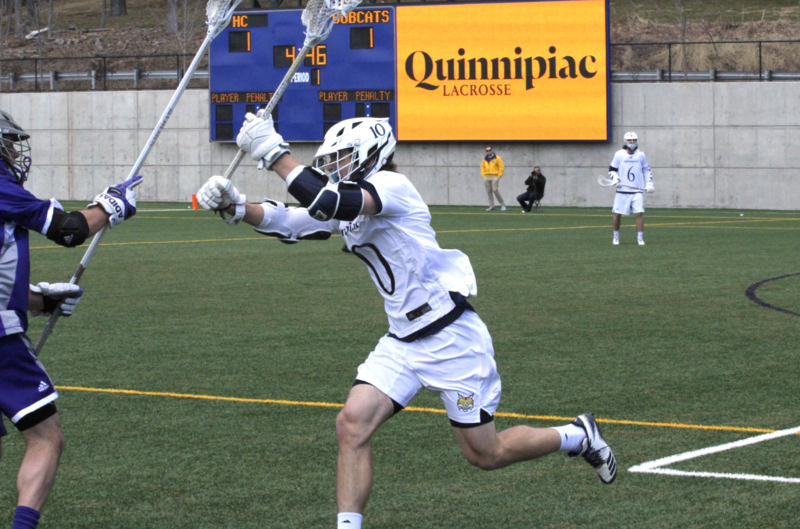 The Quinnipiac men’s lacrosse team (4-5 overall, 1-0 Metro Atlantic Athletic Conference) battled all day long but fell to the Holy Cross Crusaders (2-7 overall, 0-4 Patriot League) by a score 14-13. Senior midfielder Brian Feldman led the way with four goals, while freshman attack Jake Tomsik had two goals and three assists. It was a back and forth contest all day, but the Bobcats never led during the game. The first quarter was a defensive showcase, but sloppy play on both sides. The two teams exchanged goals, with Holy Cross’s senior attack Logan LeBlond getting two goals to put the Crusaders ahead 3-2. The physicality of the game began to pick up, as each team received fouls in the opening minutes of the second quarter. Holy Cross then netted two goals to go ahead by three, but Quinnipiac responded with two of their own. By the end of the first half, it remained a one-goal game as LeBlond netted five of the Crusader’s seven goals, giving Holy Cross a 7-6 lead. Looking at the stats, Holy Cross was dominating in faceoffs (winning 12 of 15), ground balls (24-6), and outshooting the Bobcats 22 to 13, but still only held a one-goal lead. The Bobcats did respond with a good second half, but it would not be enough. Feldman secured his hat trick just 21 seconds into the half to tie the game. However, like the first half, the story of the game was small runs, as each team consistently went back and forth, scoring two then giving up two. Holy Cross was able to take a 12-10 lead into the final quarter. The Crusaders were able to extend their lead to 14-10 on goals by sophomore attack Kevin Kodzis and junior attack Drew Babiak halfway through the final 15 minutes. But Quinnipiac did not give up, as they crawled back and were able to cut the lead to one on Tomsik’s second of the game with 3:13. However, despite two good looks for Feldman in the final minutes, Holy Cross was able to hold on and secure their second victory of the season. The one-goal loss marks the fourth game Quinnipiac has played in that has ended with one goal being the difference. Quinnipiac is currently 2-2 in those games, but have used those games as learning experiences. The game marks the final out of conference matchup for the Bobcats, as the focus towards MAAC play and improving their 1-0 in-conference record. Their next game will be Saturday, March 31 at 11 a.m. against Detroit Mercy in Detroit, Michigan.